Hundreds of thousands of people have been bathing at the confluence of the Ganges and Yamuna rivers at Allahabad in India, on the opening day of the 2013 Kumbh Mela festival. Up to 10 million more pilgrims are set to do so by the end of the day. 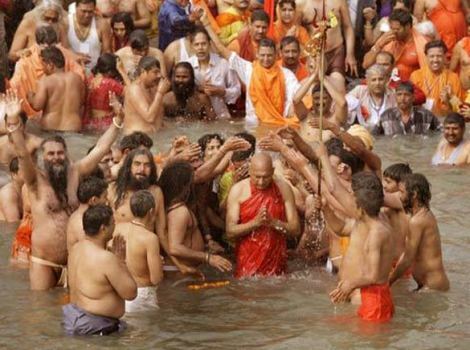 The Kumbh Mela has its origins in Hindu mythology – many believe that when gods and demons fought over a pitcher of nectar, a few drops fell in the cities of Allahabad, Nasik, Ujjain and Haridwar – the four places where the Kumbh festival has been held for centuries. The festival formally started at dawn on Monday. Led by naked ash-smeared men with marigold garlands around their necks, Naga sadhus (ascetics) arrived in a colorful procession and sprinted into the chilly waters of Sangam – the point at which the rivers converge. Teams are managing crowds on the river bank – as soon as pilgrims finishing bathing, they are encouraged to move away and make space for other bathers. “I have washed off my sins,” Mandita Panna, a resident of Nepal and an early bather, said. The main attraction at the festival is the Sadhus – Hindu holy men – who have been leading processions accompanied by elephants, camels, horses, chariots and music bands in recent days. The Kumbh Mela, which is costing the authorities 11.5 billion rupees ($210 million) to organize, is expected to generate businesses of at least 120 billion rupees, according to a report by industry association The Associated Chambers of Commerce and Industry (Assocham). The report says that the festival is expected to draw over a million foreign tourists too.